World of Hyatt Credit Card from Chase Gives You Free Nights Worldwide! Chase just launched a new hotel rewards credit card called the “World of Hyatt Credit Card.” If you haven’t heard of the hotel chain Hyatt, you probably don’t travel much, let alone get out of the house. But if you do get out a lot, and more importantly, travel, the World of Hyatt Credit Card could be for you. Let’s take a look at all the important details to assess and pros and cons of this new card. 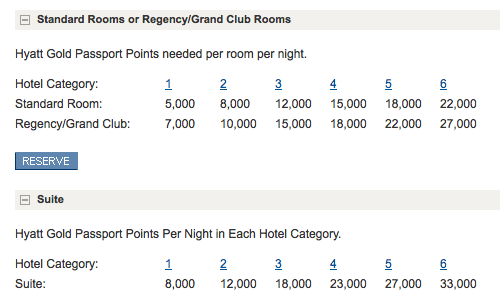 If you spend $6,000 within the first six months of cardmembership, you get 60,000 bonus points, which is good for at least two nights in the highest category Hyatt hotels. For example, the Park Hyatt Paris-Vendôme is a category 7 hotel, which costs 30,000 points per night. So you can eek out a weekend there for free if you hit the bonus. In the past, a different version of the card gave you “Hyatt Gold Passport Free Night Awards” good at Hyatt Hotel or Resort properties (and participating M life resorts) worldwide. They could be redeemed for available standard rooms and are valid for one year from issuance. Back then, all you had to do was spend $1,000, then wait 10 days for your Free Night Awards to post to your Hyatt Gold Passport account, which is created automatically once you become a cardmember. So things are basically the same, minus the higher spending requirement. But things can actually work out in your favor if you’re a bit more modest. Since you’re getting points instead of free night certificates, you can potentially get several free nights instead of just two. If you dial it down to a category 5 hotel, nights only cost 20,000. That means three free nights in places like MGM Grand in Vegas, or the Park Hyatt Washington DC. Want even more free nights? Step down to a category 3 (12,000 points per night) and you can stay at places like the Hyatt Regency Vancouver for 5+ nights. And it’s still a nice hotel in the center of town. And the award nights don’t stick you with any resort or redemption fees, unlike some rewards that could actually cost you. You also get complimentary Internet access, and you can stay in your room until 2pm with a free late checkout request. Hyatt Credit Card holders are also given access to expedited check-in, along with larger, preferred rooms on higher floors. Hello views! If you’re wondering what your Hyatt account number is, it’s the number listed on the front of your Hyatt Credit Card below the card number. 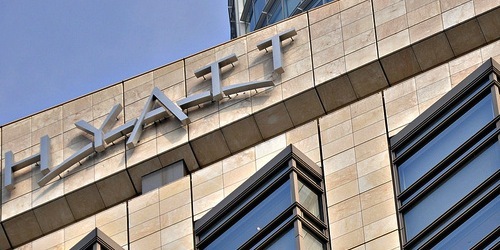 Be sure to sign up for a Hyatt account using that number if you’re not already a member. That way you can manage your awards. Once the free nights show up in your Hyatt account, you can make your reservation. As noted, it may take 10 days or so once you hit that $6,000 spend for the bonus points to show up in your Hyatt account. So keep checking your Hyatt account online around that time (or wait patiently for the e-mail to come). Mine took about 8-9 calendar days to post after spending $6,000. Note: You don’t need to pay off the $6,000, just spend the $6,000. So don’t charge it and pay it off right away thinking it will speed up the process. But do pay your balance in full when it’s due to avoid interest as you would any other credit card. Once logged in at the Hyatt website, click on “My Awards” on the main page and you should see your bonus points listed. From there you can you can click the reserve button on the website or call 800-228-3360. I like to check availability online first, and then call Hyatt directly to ensure everything goes off without a hitch. There’s also a weird issue where it doesn’t seem to let you book consecutive award nights via the website. So if you want to book two free nights in a row, it’s probably best to call them up and make your reservation. It’s super easy and once you provide your Hyatt account number, they’ll confirm that you have free awards nights available. Like just about everyone else on the planet, I redeemed mine at the Park Hyatt Paris-Vendôme, which was going for about $650 a night for my dates. That’s $1,300 in free luxury hotel goodness folks. Need I say more? On top of that welcome bonus, cardholders also get one free award night each year on their card anniversary, for a category 1-4 property. The category 4 hotels are definitely swanky, boutique style hotels in good locations worldwide. And these hotels would probably set you back a few hundred dollars for just one weekend night stay. So that reward alone should more than wipe out the annual fee associated with this card. You also earn 4 Hyatt points for each $1 spent at Hyatt properties, 2 Hyatt points for every $1 spent at restaurants, local transit (think Uber and Lyft), fitness club and gym memberships, and on airline tickets purchased directly with the carrier, along with 1 Hyatt point for each $1 spent elsewhere. And there’s no limit to how many points you can earn. You can earn a free night with as little as 5,000 points for a category 1 room, with no blackout dates. The credit card APR is a variable and tied to prime for both purchases and balance transfers, meaning it’s not a good choice for balance transfers. It’s pretty much in-line with average credit card interest rates, but you certainly shouldn’t carry a balance if you don’t want to be bombarded with finance charges. There is also an annual fee of $95, which I suppose is offset by the free night’s stay you’re rewarded with each year. Another plus to the Hyatt Credit Card is that there are no foreign transaction fees, so it’s a great credit card to use when traveling abroad. Additionally, it’s infused with smart chip protection which secures your card when you travel internationally. In summary, the new World of Hyatt Credit Card from Chase is a great deal if you’re a frequent traveler, especially if you already stay at Hyatt properties. By the way, there are roughly 500 Hyatt properties worldwide, so you’ll always have options with this hotel chain. Even if you don’t travel much, if you’ve got one big trip planned you can take advantage of those free nights and stay somewhere really nice. There are no category restrictions, so you can really put on the ritz. Despite the presence of an annual fee, it’s very easy to earn free hotel stays with this card. After all, your get 40,000 points simply by spending $3,000. Perhaps more importantly, this credit card isn’t subject to the 5/24 rule at the moment, so act fast if you’re way above that number and want a new credit card with a great bonus! If you’re looking for the most cash back instead, check out the bonus offer from Chase Sapphire. Next Next post: Do You Need a Credit Card to Build Credit History?